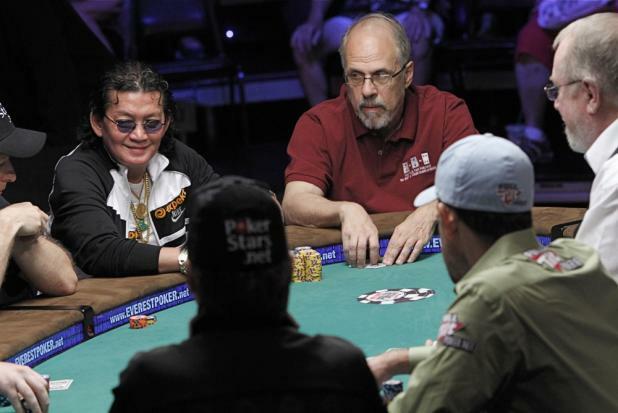 ESPN's featured table on Day 3 includes Scotty Nguyen (left), David Sklansky (center), and Adam Schoenfeld (foreground, bottom right). 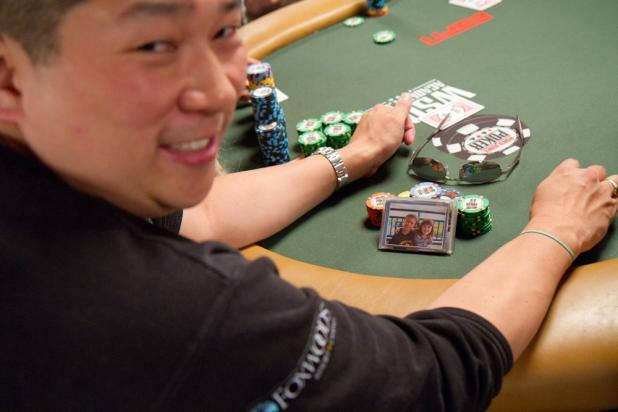 Scotty Nguyen has five WSOP bracelets, is fifth on the all-time money list for live tournaments with more than $11 million, and won the WSOP Main Event in 1998 after saying one of the coolest lines in poker history: "You call, it's gonna be all over, baby." 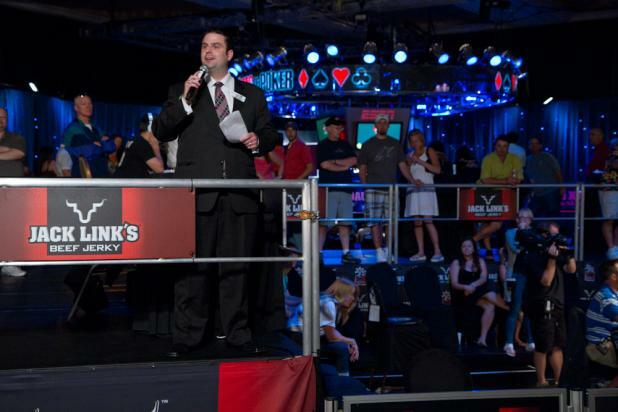 David Sklansky has three WSOP bracelets and is a prolific author of poker strategy books. 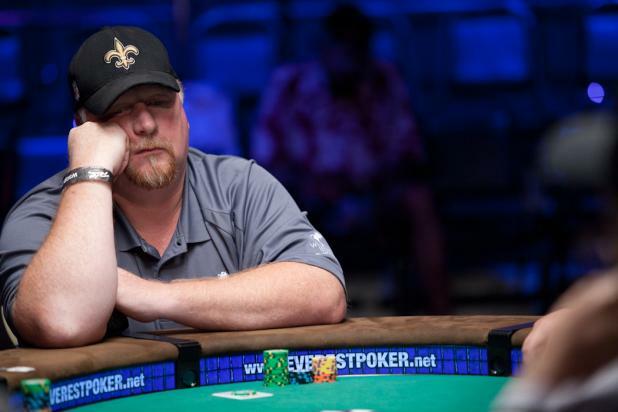 Last, and perhaps least, Adam Schoenfeld has been referred to as the unluckiest player in WSOP history, as it was estimated that he had the longest streak of playing WSOP events without a cash. Schoenfeld finally got that monkey off his back in 2008, when he cashed in the WSOP Main Event (424th place for $27,020). 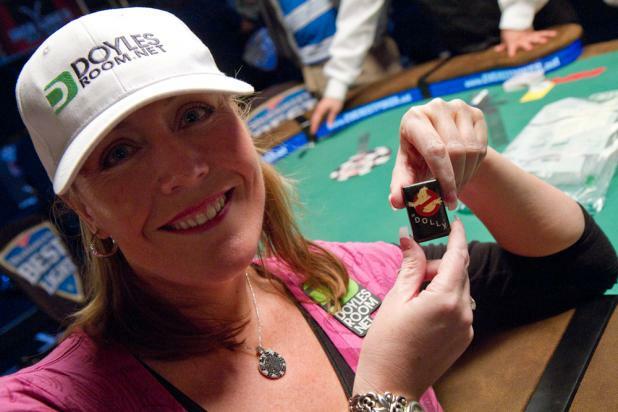 Pam Brunson poses with her father Doyle's card protector at the end of Day 1d of the WSOP Main Event. The polished black rock has the words "Texas Dolly" on it, and the logo from the 1984 film "Ghostbusters." Doyle nicknamed the rock "Casper," after the old Casper the Friendly Ghost comic books. Doyle has been using Casper as a card protector since somebody gave it to him more than 20 years ago. With Doyle's great success, other players felt it was a good luck charm, and often asked to rent it -- at the peak of its mystique, Doyle charged $500 for 30 minutes with Casper! Howard Lederer offered to buy Casper, and they agreed that for $3,500, Lederer would be put into Doyle's will to receive Casper upon Doyle's death. But when Doyle's daughter Pam used Casper to win a big tournament, she wanted to keep it in the family. Lederer agreed to release future ownership of Casper back to the Brunsons for $7,500, and now Casper will be passed down to Pam. 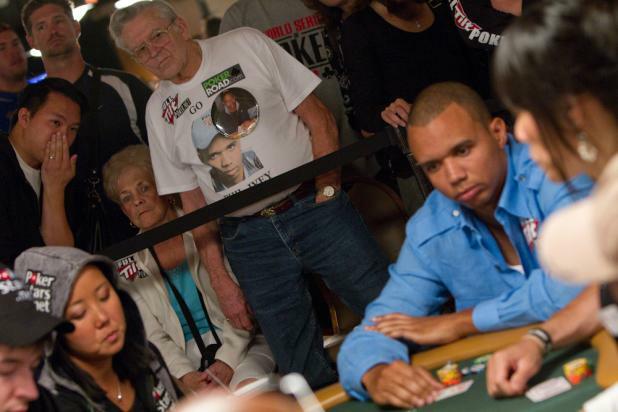 Every year, Mel Humphrey and his wife Pat visit Las Vegas to cheer for Phil Ivey during the WSOP Main Event. The Humphreys have known Ivey since his days of sneaking into Atlantic City cardrooms when he was underage. The couple has been featured on ESPN many times, and Ivey has said he is very touched by their loyalty. Jason Calacanis (founder of Mahalo.com, pictured here) has a very interesting side bet against David Sacks (founder of Yammer.com). The two tech entrepreneurs have a last-longer bet for the WSOP Main Event, and whoever busts first has to give the other 10,000 shares of stock in his company. While it's unknown exactly what percentage of each company that represents, it's the first time (that we know about) that two businessmen have literally bet their companies on the WSOP Main Event. When the numbers are finally tallied, WSOP Tournament Director Jack Effel takes the stage in the Amazon Room to answer the big question on everyone's mind each year -- how many people played in the WSOP Main Event? Many people were surprised to see 7,319 players registered, which makes this the second largest tournament in history (only behind the 2006 Main Event, which had 8,773). The total prizepool is $68,798,600, and the winner will take home $8,944,138. 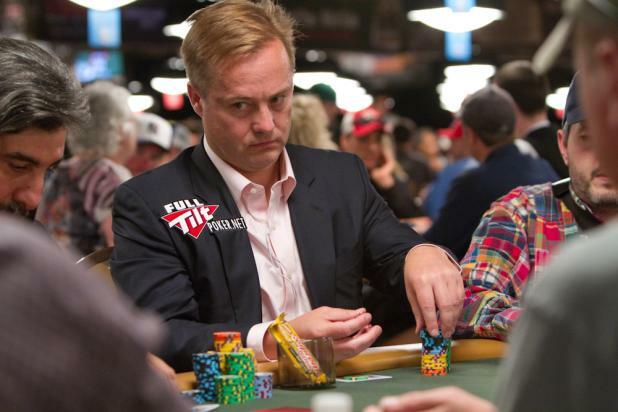 Bernard Lee is best remembered for his 13th-place finish in the 2005 WSOP Main Event, when he received a lot of TV time for always having a photo of his kids on the table with him. Lee's photo has been showed on TV so many times that some people have said his children are "the most famous kids in poker." Lee's son Noah is seven years old, and his daughter Maya is five. In the back corridor behind the Amazon Room, several dozen dealers wait to begin their shifts on Day 1d of the WSOP Main Event. 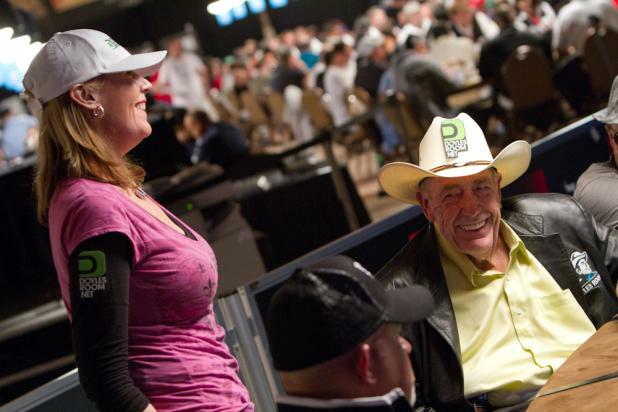 Pamela Brunson didn't have much luck on Day 1d of the WSOP Main Event, and after she busted, she visited ESPN's secondary featured table to check on the progress of her father, the legendary Doyle Brunson. Doyle was doing well, and eventually finished the day as the chipleader on his table. 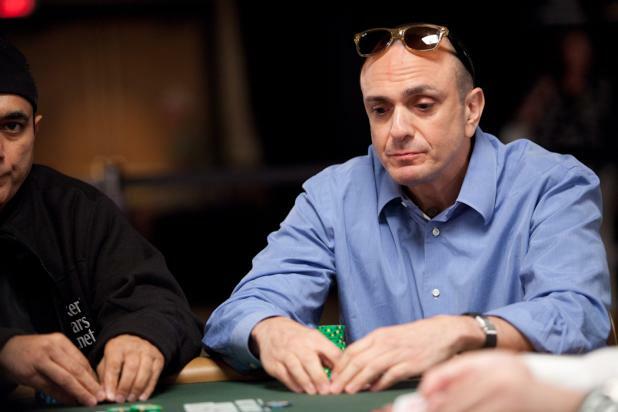 Darvin Moon is not your typical poker player. But the self-employed logger from Maryland worked his way through last year's WSOP Main Event to reach the November Nine as the chipleader, bust Phil Ivey, and eventually finished in second place to earn more than $5.1 million. Moon only played a handful of smaller tournaments in the past year, but he is back in the WSOP Main Event, playing at the ESPN featured table on Day 1d. Hank Azaria is a familiar face to movie fans, but his voice may be his most valuable attribute. Azaria has voiced some of the most loved supporting characters on "The Simpsons" for more than 20 years -- bartender Moe, Apu of the Kwik-E-Mart, and Chief Wiggum. Azaria is playing the WSOP Main Event on Day 1d.